The Sunseeker 3010DS is our most luxurious coach with sleeping for up to 8. This 32’ single-slide unit will sleep the whole family and yet is perfect for a couple looking to test the RV lifestyle in style. 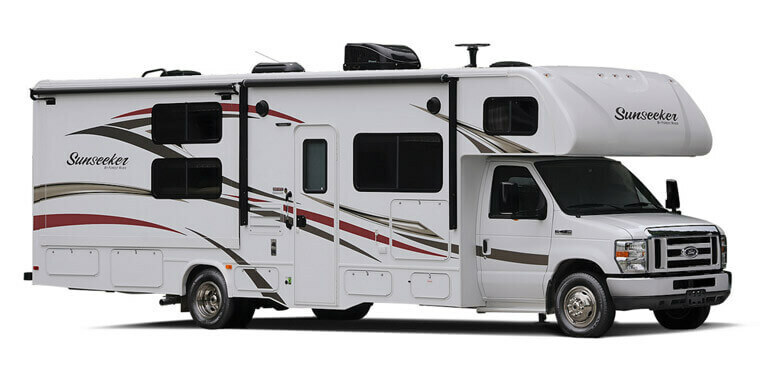 It features a queen bed in the back, sleeping over the driver and a dinette and couch that both convert to beds. Rear bedroom has a queen size bed, two cabinet closets, and tons of space to get ready. 32" Flat screen TV with DVD player, sofa, and dinette table with booth seating, Pleated night shades. Back up camera, and touch screen am/fm/MP3/CD/DVD Dash Radio.